I moved to Washington, D.C. last September to begin a post-graduate leadership program. I went to Auburn’s season opener, and then I made the long drive North to see what they had to say about things. My fiancée Rosie (now my wife) visited me the week of Thanksgiving. We spent Thanksgiving in Charlottesville, and then headed back to the Beltway. Long story short: Her flight time required her to be at the airport in the middle of the 4th quarter of the Iron Bowl, something I (somehow) didn’t realize until it’s too late. We leave at half time. Things are tense, inside both Jordan-Hare and my 12-year old, 163-thousand-mile Chevy Blazer. I am (selfishly) not pleased with the situation, but we leave and start the drive to Baltimore. I think at least we can catch it on the radio. It’s not on the radio. I am embarrassingly upset by this, and I make Rosie refresh Twitter every two seconds so that I can stay as informed as possible. I am desperately trying to keep up, and it is only later that I realize how junkie-like my behavior is. And then my power-steering goes out. A high-pitched whine, a little pop, and all of a sudden I’m up a certain creek without a paddle. I pull off at an exit, feeling more panicked about the part of Maryland I’m in than the game. Anxiety for our safety fails to prevail for long, however, thanks to the pop pass to Sammie Coates. I am simultaneously checking my engine, talking to AAA, and keeping up with the game, somehow so preoccupied with the Tigers that I don’t even notice my serpentine belt is missing. I conclude that, despite my expertise, I have no idea what’s wrong. We decide that it is too late for Rosie to make it to the airport, and I am secretly glad that my car broke down. I call my dad while I wait for the tow truck to show up. I’m still on the phone with my dad as the clock stands still, and in this moment, him watching, me listening, I am enthralled by the unique vision his words cast for me. He narrates the play as the Crimson Tide pulls within range of a winning field goal, and the ensuing set-up for a long kick, a kick that is too long to lead to anything other than over time, he tells me. There is silence, long and full, and now I think about how meaningful that silence was, the place where possibilities came and went until they crystallized in the arms of Chris Davis, nine seemingly infinite yards deep in enemy territory. I don’t have a clear memory of the words he said as Davis wound his way back home down the sideline, but I don’t have to. It was woven there for me, clear as day, in the narrative spoken across miles and miles, from father to son. Looking back on it, nearly a year later, I realize how powerful a thing the spoken word really is, to have a narrative passed down, to see ever-so-briefly through my father’s eyes. 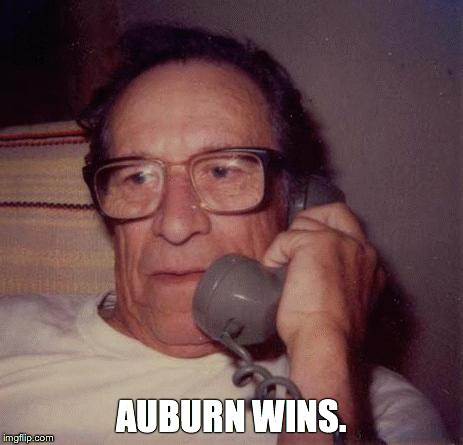 “Auburn wins.” That was all he said when we crossed the goal line. No wild verbal gesticulating, no loud cry of giddy disbelief. Just the level, even tone of a man with a story he wanted me to understand, a picture he wanted me to see. And it’s the knowledge that we were a part of a millennia-old tradition, a tradition of passing down myth and history to sons and grandsons, Moses to Homer to Gary, that makes me glad I wasn’t in front of a television for the last second of the Iron Bowl. Stuart Spooner is a native of Auburn (OFA for life), a 2013 AU graduate, and a recent transplant to the Washington, D.C. area, where he lives with his wife. Although he has yet to accomplish anything worth noting in a bio, he pays attention to all sorts of things, and occasionally goes so far as to think, write, and/or tweet about them. Follow him on Twitter @StuartSpooner, or shoot him an email at: [email protected]. Related: Auburn wins, Words fail: AU philosophy professor Kelly Jolley relives the _______ of the Iron Bowl.